​When local fisherman snagged Chinese ceramics in their nets off the coast of Indonesia in 2003, it led to the discovery of a shipwreck that occurred more than 1000 years ago. After excavations in 2004, the cargo of the “Cirebon Wreck,” named for the nearby town, was brought to the surface, with some surprising discoveries. Enjoy the slideshow presenting some of the colorful sights of Sri Lanka. A pear-shaped island located to the south of India, Sri Lanka produces more than 130 types of gemstones, but sapphires make up 85 percent of the value of the nation’s gem exports. 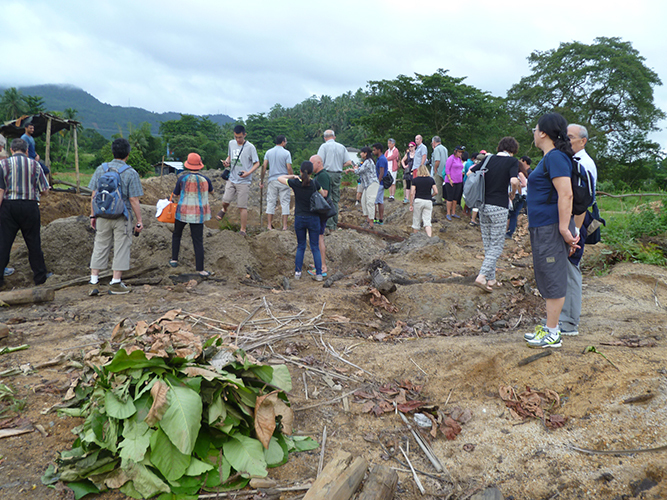 The gem fields are primarily alluvial deposits located in the Highland Complex. 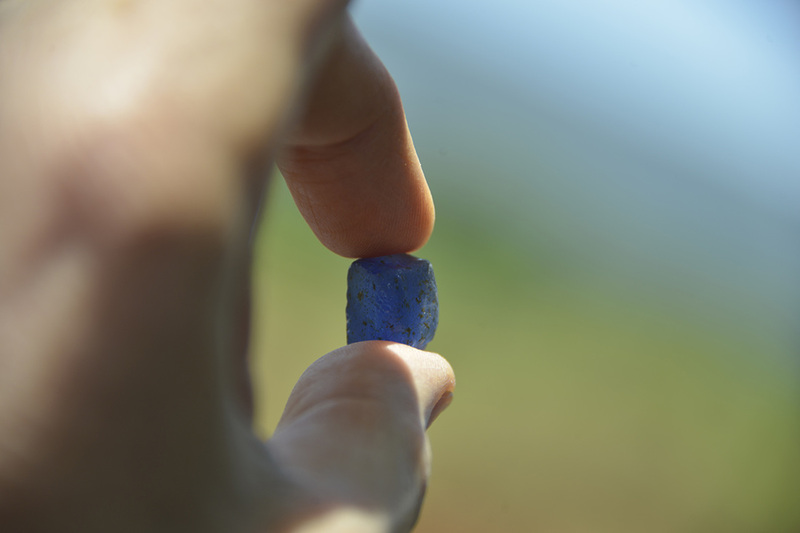 Rough sapphire from the Elahera region. An estimated quarter million pieces were recovered from the 10th century merchant cargo ship that sank in Indonesian waters, mostly ceramics, gold and silver items, knives, Hindu and Buddhist religious objects, and glassware. But, also among this precious cargo were 400 Ceylon sapphires, thousands of garnets and zircon, large quantities of lapis lazuli and quartz, and jewelry made with Sri Lankan sapphires and Indian diamonds. The director of the GIA Research Center in Bangkok, Dr. Ken Scarrett, was asked to examine the stones and determine their origin. He estimated that the garnets, zircons, and quartz were from Sri Lanka or South India while the the lapis was from Afghanistan. As for the 400 sapphires, ranging from blue to yellow to pink, he concluded that they were from the gem gravels of Ceylon (Sri Lanka). He also confirmed that, even after more than 1,000 years, the gem material coming out of the alluvial gravels today is the same as it was back then. Sapphires were already known in the 2nd century on the island, and by the 4th and 5th century, active international trade was taking place. Its sapphire mines are thus considered the oldest in the world. It has been home to many of the world’s most famous sapphires, as well, including the 563-carat Star of India and the 423-carat Logan Sapphire. Some even claim that the engagement ring belonging to Princess Diana, later given to her son's bride, Kate, was made with a Ceylon sapphire. Sri Lanka is also known for 130 other gems, but the beloved sapphire accounts for more than 85 percent of the value of the nation’s gemstone exports. 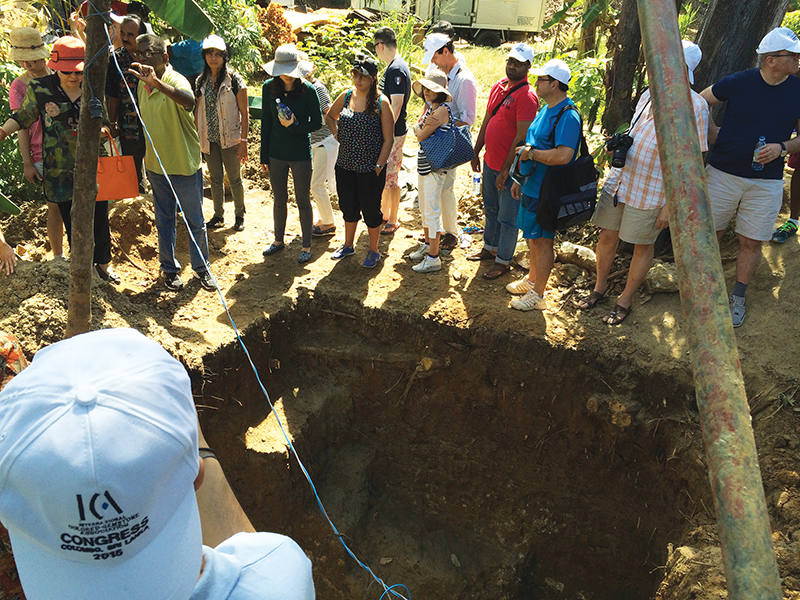 To gain insight into sapphire mining in Sri Lanka, 50 delegates from the ICA Congress in Colombo set off to explore the nation’s major mining areas, as well as enjoy a few of its cultural attractions along the way. Here is a glimpse into our journey. Measuring 432 km in length and an average of 224 km in width, the island of Sri Lanka is made up of pre-Cambrian metamorphic rock, and is divided into three major complexes: Highland, Eastern and Western Vijayan, and Southwest group. The majority of the gem fields are in the Highland complex, composed of a wide belt running from the bottom left of the island through its center to the northeast. Sri Lanka’s gems are largely found in alluvial deposits in the Highland belt, made up of gravels that have washed down from the mountains and been deposited in the flood plains of rivers and lakes. The majority is located in agricultural lands, mainly rice paddies. Because the land is used for the dual purposes of mining and food production, the government has issued a number of regulations to protect the miners and the environment, meaning that lands must be restored to their original condition after mining has stopped. It holds a deposit from the miners to ensure that the land is indeed restored. Women and children may not participate in mining in order to avoid exploitation. 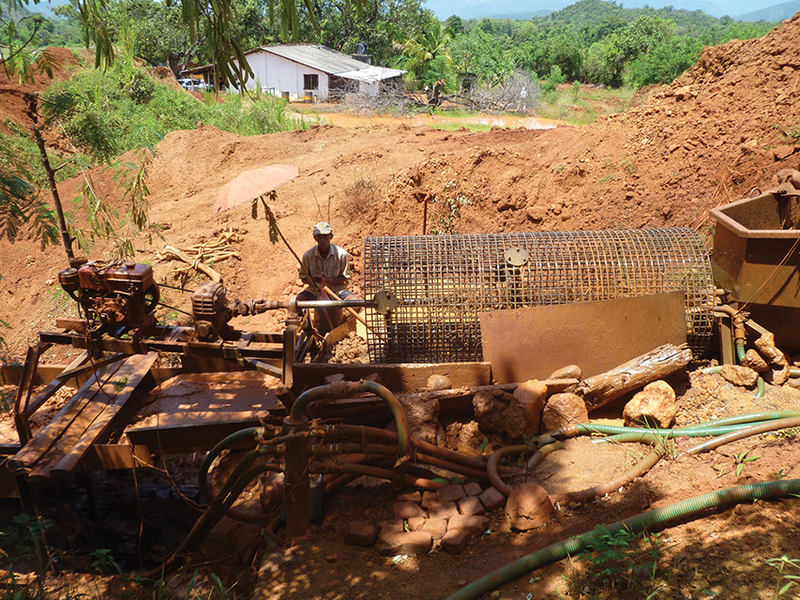 According to the nation's National Gem and Jewelry Authority, Sri Lanka has around 6,000 active mines, with 40,000 men working underground daily. By law, all mining is artisanal, meaning that the only tools permitted are picks, shovels, spades, and baskets. Mechanized mining is prohibited, even though some mines may continue operations until their current permits expire. We visited one such mine. Licenses are required for all mining, regardless of size, whether for an individual or a company. Clearly, the work of a miner is difficult, with no guarantee of success. In some cases, they are paid only a few dollars a day, while others share in the profits when the stones are sold. After a day’s journey on small roads, the group arrives at the rock fortress of Sigiriya, also known as Lion's Rock, a UNESCO World Heritage Site. 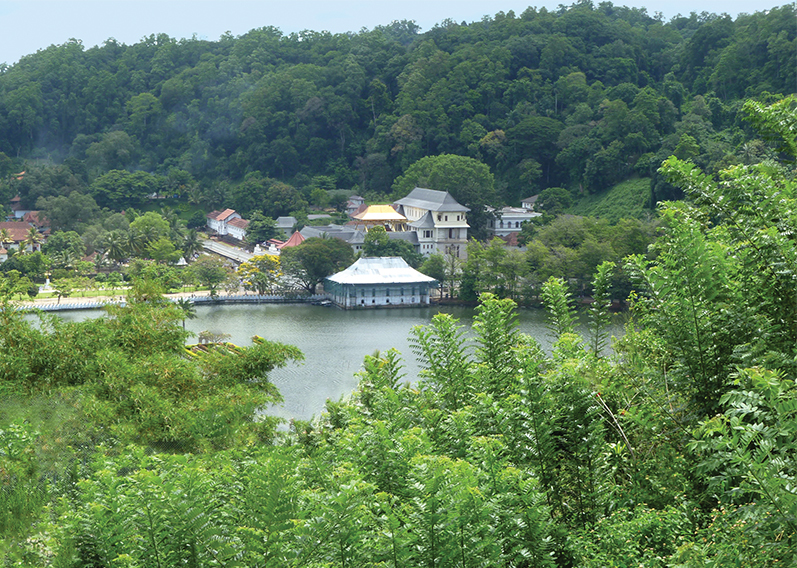 Rising 200 meters from the jungle floor, the ancient city dates back to the 5th century, when King Kasyapa constructed a royal residence on the rock, complete with a complex hydraulic system, consisting of canals, locks, dams, bridges, fountains, and water pumps. A steep staircase of 1250 steps leads to the top. Some 18 colorful frescoes are definitely worth a stop on the way up, along with pools and various other structures. 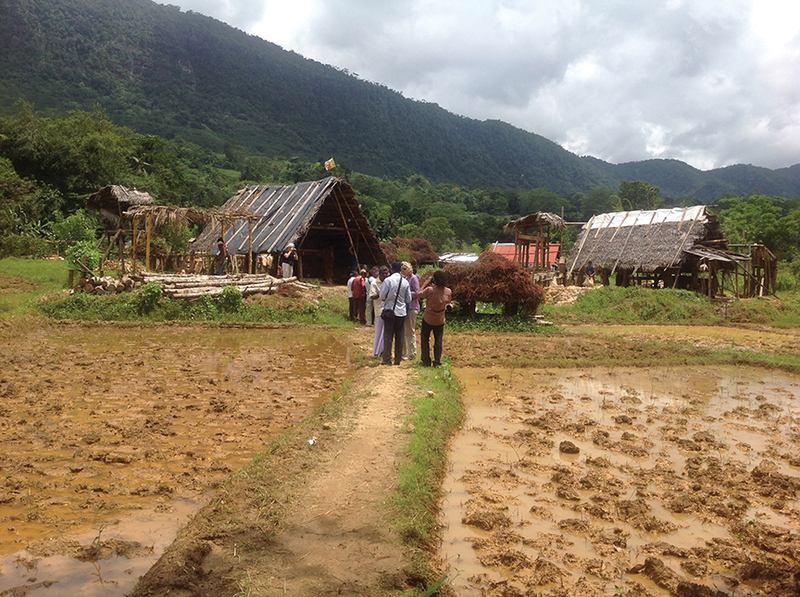 The next day, we head for the alluvial gem fields in the Elahera region of central Sri Lanka. 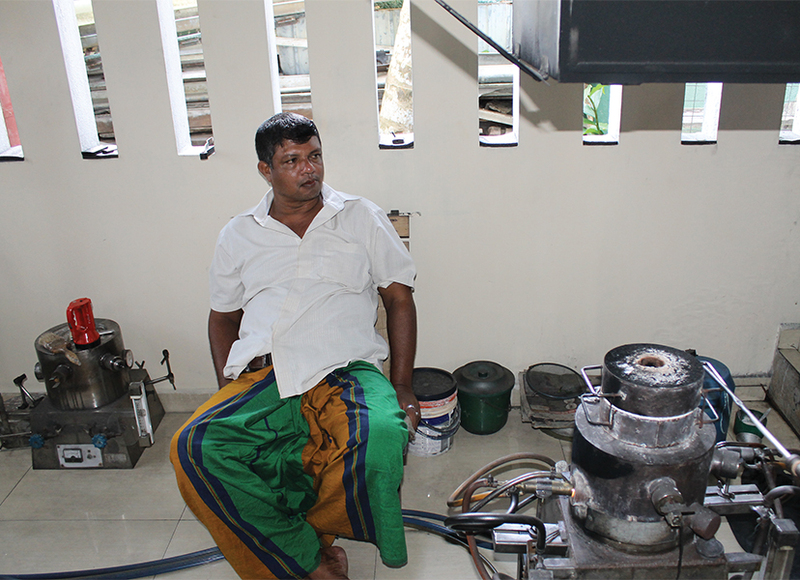 This area is estimated to produce up to 35 percent of Sri Lankan gemstone exports, including some large sapphires. Although mining dates back to the 12th century, commercial operations began in the 1960s. 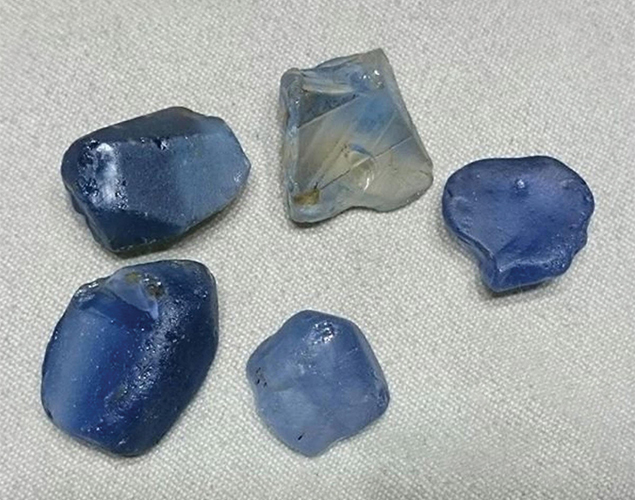 Typical of residual types of gem beds, the deposits occur mainly along the Kalu Ganga and Aban Ganga river systems, and include blue sapphire, ruby, chrysoberyl, garnet, spinel, tourmaline, zircon, and brownish to whitish corundum, generally ranging in size from 1 to 10 cm. For centuries, mining methods have remained the same. 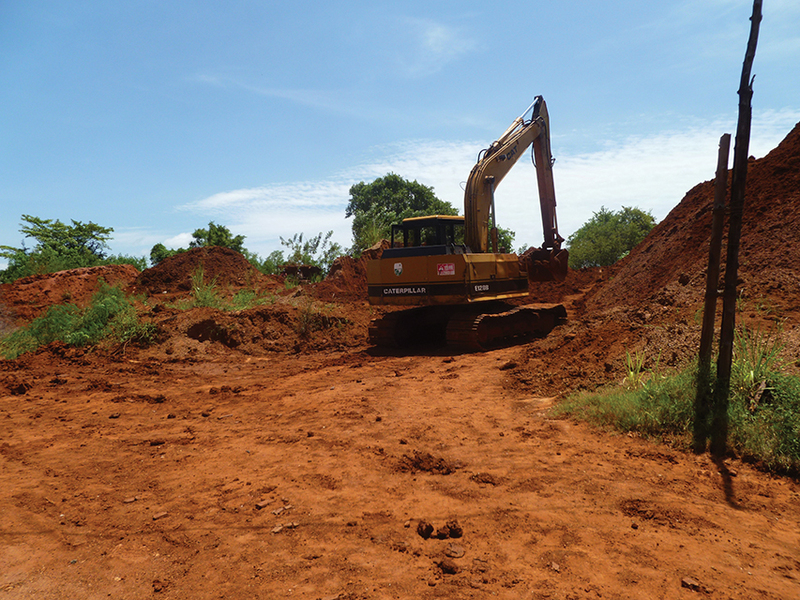 To find a deposit, miners drive a long pole into the ground to find the gem-bearing gravel layer, which can range from a few meters to more than 30 meters. A shallow pit is dug or, if necessary, a deep shaft is constructed and reinforced with planks and fern leaves. Once the gem-bearing material is brought to the surface, by hand or using pulleys, it is washed in shallow baskets to sort out the gems. Artisanal operations for heating and treating the sapphires and other gems, using small ovens and various chemicals, also take place in the Elahera region. 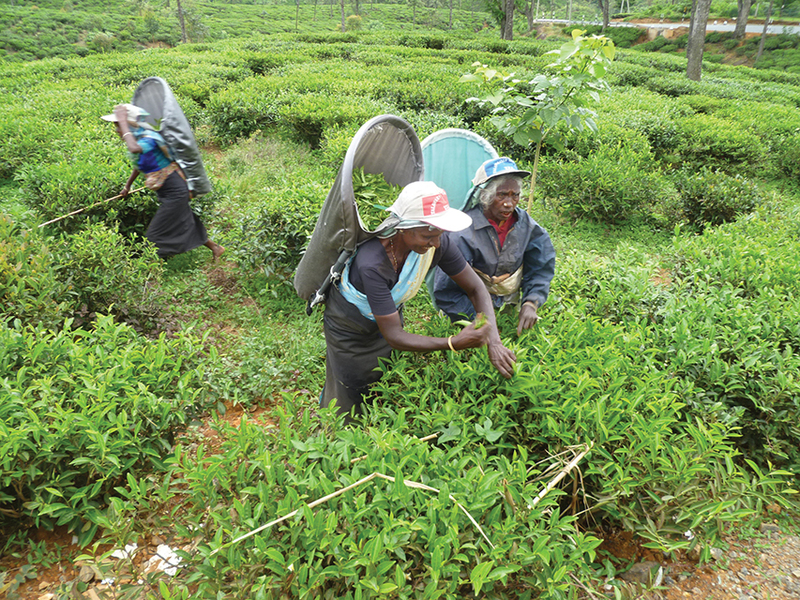 The next morning, we head out for Matale, and a stop at the very interesting Heritage Spice Gardens. After a brief tour of the gardens and an introduction to the many Ayurvedic remedies formulated from herbs grown there, we leave for Kandy, the religious capital of the Sinhalese. The historic city is home to the picturesque “Temple of the Tooth,” guardian of the Tooth Relic of the Buddha since the 4th century. That afternoon, the group leaves the palm trees of the lowlands for the pine trees of Nuwara Eliya, elevation 1,868 meters. 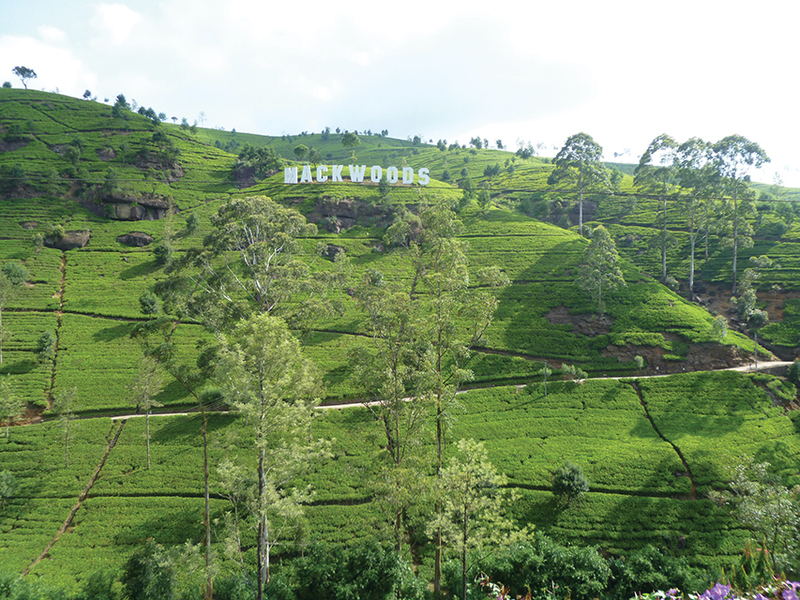 The journey takes us along scenic and winding mountainous roads, passing beautiful waterfalls and vast tea plantations, to finally reach the town known as Little England. An evening in the cool mountain air is a refreshing change from the heat and humidity of the low country. Early the next morning, we leave the cool air of the mountains to head south to Ratnapura, the gemstone center of Sri Lanka. Here, we are met by Dr. Gamini Zoysa, ICA Director, and Mr. Altaf Iqbal, ICA Ambassador to Sri Lanka. They kindly show us around providing more information on the mining, heating and cutting of gems in the area. In Sinhalese, Ratnapura means City of Gems, and it soon becomes clear why. It is the nation’s main source of gemstones, including all colors of sapphire, but also ruby and cat’s-eye, among others. The population of the bustling little city has exploded over the years because of gem mining and the resulting cutting and subsequent trading activities. By law, however, foreign nationals and companies may not engage in gem trading and are allowed to only export stones that are cut and polished in Sri Lanka. After visiting a variety of shallow and deep mines, we head for the Kalu Ganga River, where some members try their luck in river mining. Flowing from the central hills through Ratnapura, the Kalu Ganga carries gems here from various parts of the island. Mining the river is carried out using with long poles with a hoe-like attachment at the end to dredge up the gem gravel. Once at the surface, the gravel is washed in shallow round baskets. 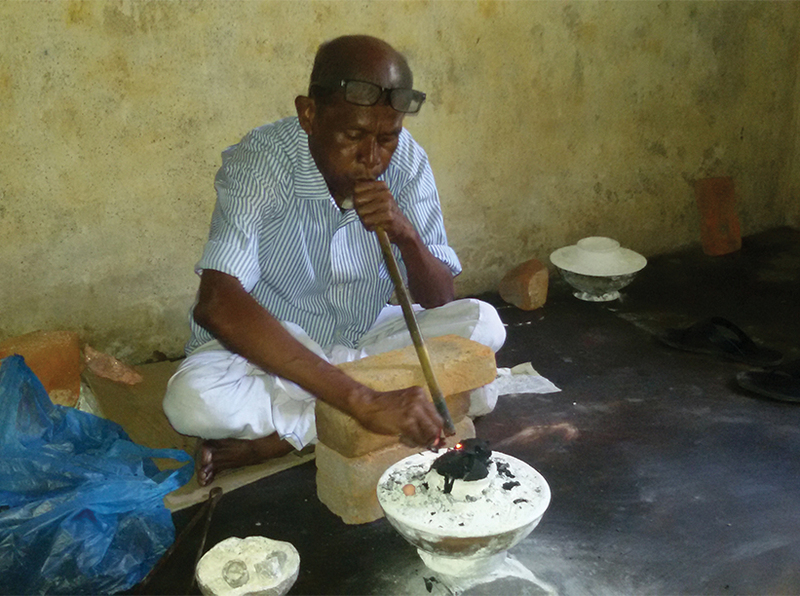 Following a brief trip to Ratnapura’s gem market, we witness the remarkable talents of experienced artisans who use traditional methods to heat gems. The stones are covered with a paste of burnt coconut husks and lime, placed in a crucible in a charcoal fire, and then a “blower” blows through a tube to increase the heat of the fire, and thus the gems. It usually takes three to six hours to reach the desired color. It seems that these ancient techniques are as effective as modern-day ovens, if not more so. Beruwala is next on our itinerary. Although the bustling resort town is known for its pristine beaches, it is the nation’s second largest gemstone market and is fast becoming a global hub for gemstone trading. Its dealers travel not only in Sri Lanka but also the world to bring back rough that is heated, treated, and cut in the area. After winding through narrow streets, we arrive at the trading district, where hundreds of people with signs of welcome meet us with refreshing coconut water to quench our thirst. Following a few words of greeting by local authorities and ICA members, traders arrive in large numbers, offering a wide range of gems, in their air-conditioned offices or right on the street. 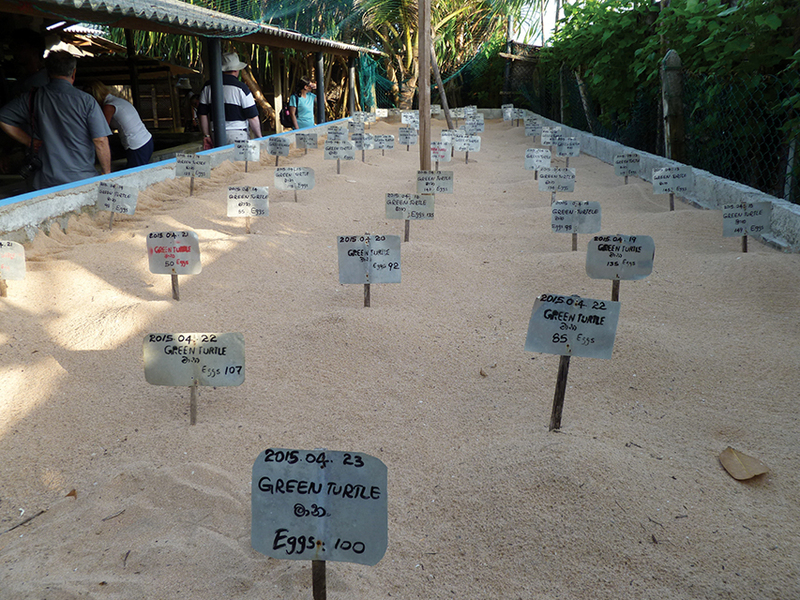 That evening, we exchange gem trading for turtle watching at the Victor Hasselblad Turtle Conservation and Research Centre on the western shore near the town of Hikkaduwa. 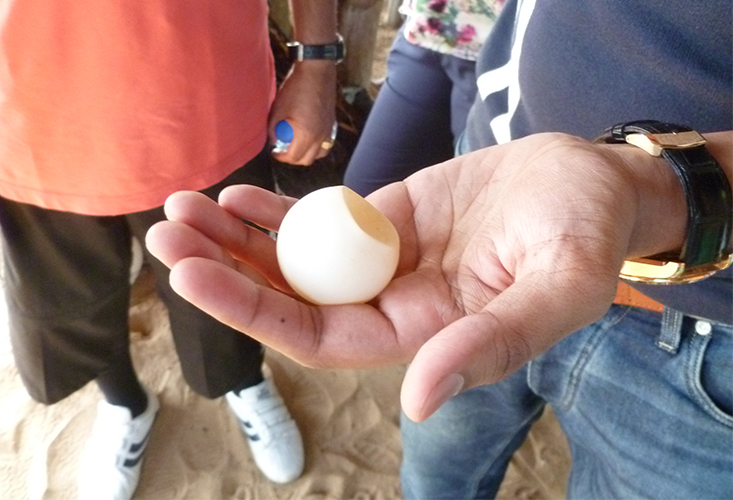 Because poaching and predators are a big problem, the foundation pays people more than the black market rate to bring in turtle eggs, which then hatch in safety. The baby turtles are nurtured for three days in a basin of water before being returned to the sea. Several turtle rescue centers in the area provide this valuable service to help the survival of the babies, estimated to be 25 percent, compared to less than one percent of those with no protection. 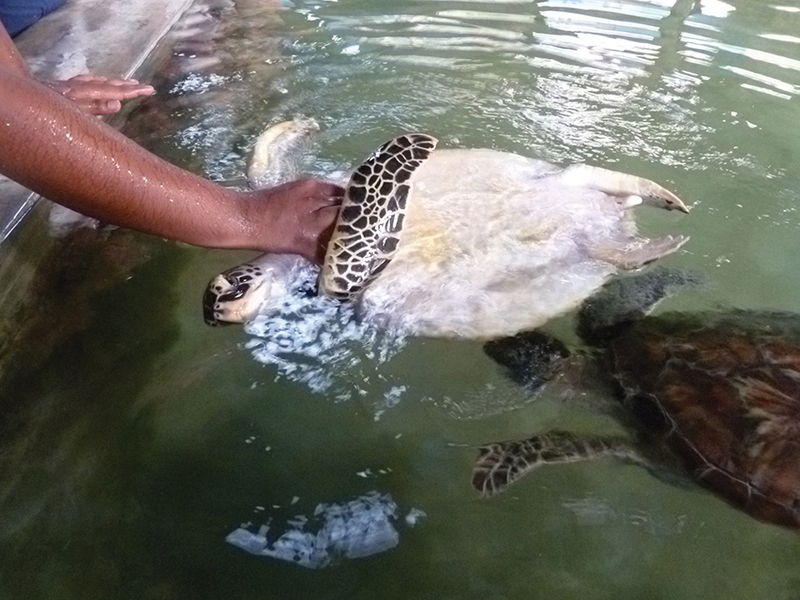 The center also rescues and rehabilitates turtles injured in fishing nets, boating incidents, and other accidents. The last morning of the tour finds us at a moonstone mine. At the bottom of the 25-meter shaft, a miner fills up a basket with gem material, which is then hoisted to the surface using pulleys for washing. 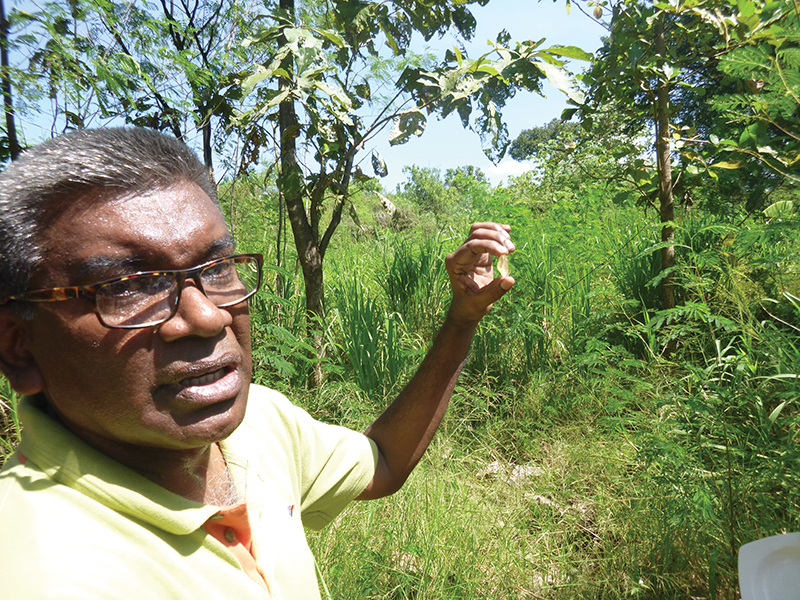 The mine’s owner also has cutting and polishing facilities nearby, along with groves of cinnamon plants whose dried leaves are waiting to be processed into oil. Finally, the group returns to Colombo, via the 16th century Dutch Fort in the picturesque seaside town of Galle. 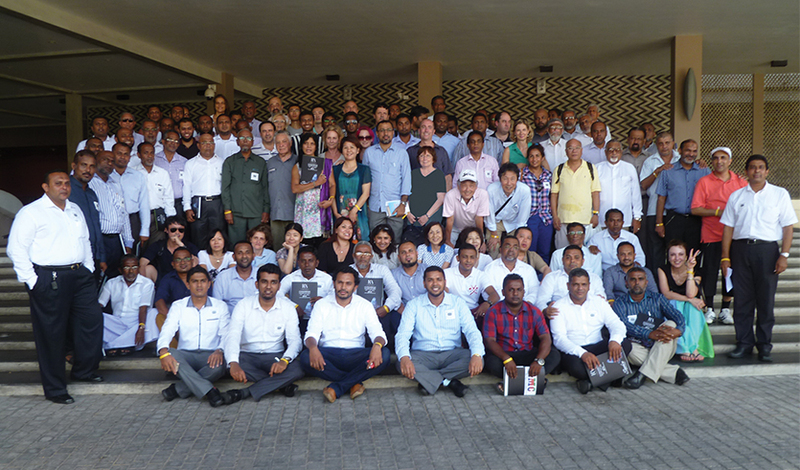 The journey has been quite informative, always interesting and highly enjoyable, leaving us all with fond memories of Sri Lanka and our time spent together in search of sapphire. The group looks at various gems in the Elahera gem field. 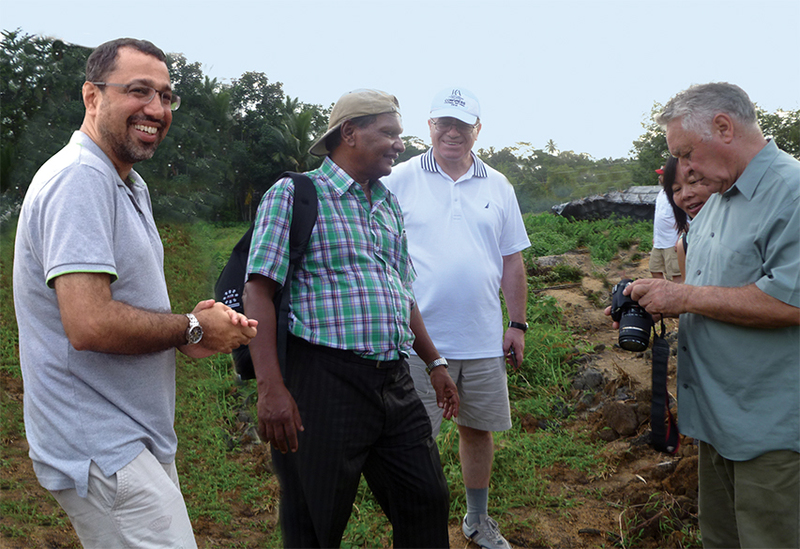 Photo of mine tour participants, ICA members from Sri Lanka, and gem traders from Beruwala. 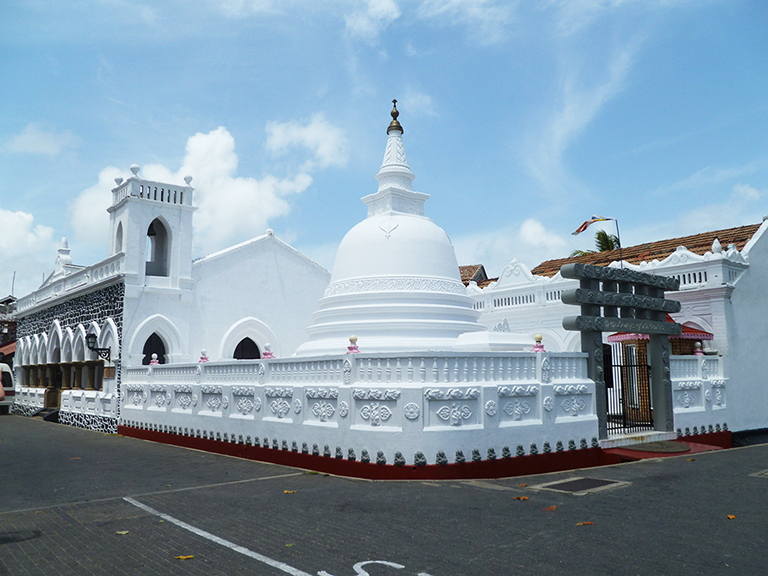 A Buddhist temple in Galle.